Shadowgrounds Game Review - Download and Play Free Version! 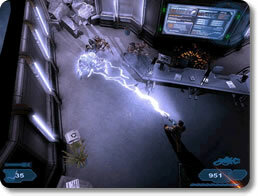 Take on Alien Invaders in This Futuristic Shooter! Become Wesley Tyler, a seemingly ordinary mechanic with an extraordinary task. Aliens have invaded Tyler's home planet, Ganymede, and it's up to him and the few survivors to kill the aliens and make it off the planet! 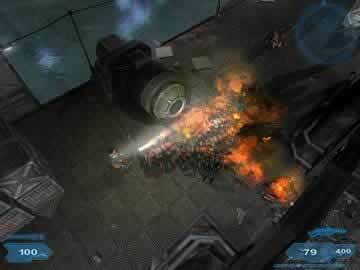 Take on alien monsters of varying sizes and difficulties to save the captain of a downed ship. Escape with the captain and destroy the alien mothership to save Ganymede! In this top-down shooter, battle hordes of aliens, rescue survivors and find clues to the whereabouts of the downed captain and his ship. Pick up weapons along the way including pistols, grenade launchers, miniguns, flamethrowers and more. Shadowgrounds uses light to obscure predators and hide secrets, but with your flashlight and motion detector, you should be fine--as long as you don't waste your limited power supply! Find ammunition, health, weapon upgrades and other useful clues in the puzzle-like levels as you demolish tons of aliens. Go from Fixing Machines to Saving the Planet! Take no prisoners in this rampage of a game. It is completely up to you to kill all the monsters, save the captain, destroy the mothership and escape. You have no help. Hopefully Wesley's mechanic skills and your sharpshooting can help him! If you like classic, top-down shooters or games that require killing hordes of extraterrestrial monsters, then Shadowgrounds is the game for you! Shadowgrounds is a thrilling shoot 'em up game that has you facing off against alien invaders in a remote space colony on one of Jupiter's moons. You'll need to make use of a variety of upgradeable weapons such as a Pulse Rifle or Flamethrower to fend off the alien menace. There are three difficulty levels to adjust the challenge to something that's right for you. A variety of gruesome and deadly creatures lurk throughout each level. The included story and musical scores help make this a good and entertaining game. 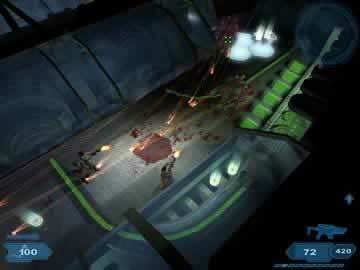 Gameplay in Shadowgrounds is very similar to many other shoot 'em up or first-person shooter games. This game is a top-down shooter, meaning that you're looking down on your character from above. You'll make your way through each level, and have different tasks to complete along the way. Some tasks will simply be to eliminate enemies, while others may have you collecting items (like keycards to open doors). You might need to repair machinery, or rescue other people in the colony. The alien creatures you fight often come in groups or waves, and often appear after coming out of the walls or floors. As you progress through the game, you'll come across a variety of weapons that you can use to blow away the aliens. You start with just a simple pistol, but can use weapons ranging from rifles to grenade launchers. You can even upgrade these weapons to make them more powerful or add secondary effects with items dropped by the aliens. You also have a flashlight that you can use to light dark rooms and areas throughout the game. However, the flashlight can only last so long before it will need to recharge, so you'll need to use it wisely. The game includes three different difficulty settings to let you adjust the challenge to something that's right for your level of skill. Despite the level of difficulty that you choose, once you've played the game and begin to learn the tactics of the enemies you can easily avoid damage and take them down. The controls in the game are like those of many other shooters or FPS games. The WASD keys are used for movement, the mouse controls aiming and shooting (although you can only aim in a direction rather than specific spots), and the E key is used to interact with items and doors. They're simple to use and easy to learn. You can also use gamepads to allow other players to join you in the game, although there are no online or LAN options for co-operative play. One downside to the game is the inconsistent feel or atmosphere as you play through each level. There are times where the game tries to create a scary feeling with dark areas and various sound effects. Other times you might be in brightly lit rooms or hallways. Sometimes you will face off against swarms of alien enemies, while others may have you fighting only one or none at all. This game attempts to create the same sort of fear as a game like Doom, but falls a bit short. Additionally, the cheesy dialogue and voice acting just doesn't fit. The graphics in Shadowgrounds won't match up to a game like Halo, but still look pretty good (especially when compared with other similar games). The characters, vehicles, aliens, levels, and weapons are all detailed and unique. There are various light effects (including your flashlight) that add to the look and realism. The music also very well done and a great addition to the game. Overall, Shadowgrounds is a thrilling and fast-paced shooter that could appeal to a wide variety of players. There are a few issues such as the cheesy dialogue, but that doesn't stop this from being a game worth playing. There are a bunch of different weapons for you to use and upgrade. There are three difficulty levels to adjust the challenge to your skill level. A variety of enemies with different looks and abilities lurk around every corner. An interesting story and excellent music helps make this one heck of a game. Click above to see a battle within Shadowgrounds.